A number of Gingerbread-hungry developers (including some from the CyanogenMod team, particularly Slayher) are hard at work preparing CyanogenMod 7 for its Thunderbolt debut, and progress is steadily being made. 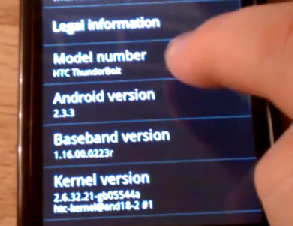 In the video above, you can see CyanogenMod 7 successfully booting up on the HTC Thunderbolt (albeit without the signature boot animation) and running through various simple tasks in Android. At this point, there is no data connectivity (3G or 4G), no sound, and no Google Apps. The most anticipated Android phone to date is showing just how fast the community can work to get a device to this point, and frankly, it's impressive. We'll keep you updated on the progress of the hard-working people behind this feat as the information comes in. Credit to andrew8806 for the video, the CyanogenMod team and specifically device maintainer Slayher for the progress so far. Thanks to ProTekk for compiling and testing.